This is a waterline/full hull 1/700 scale resin kit by Combrig Models. 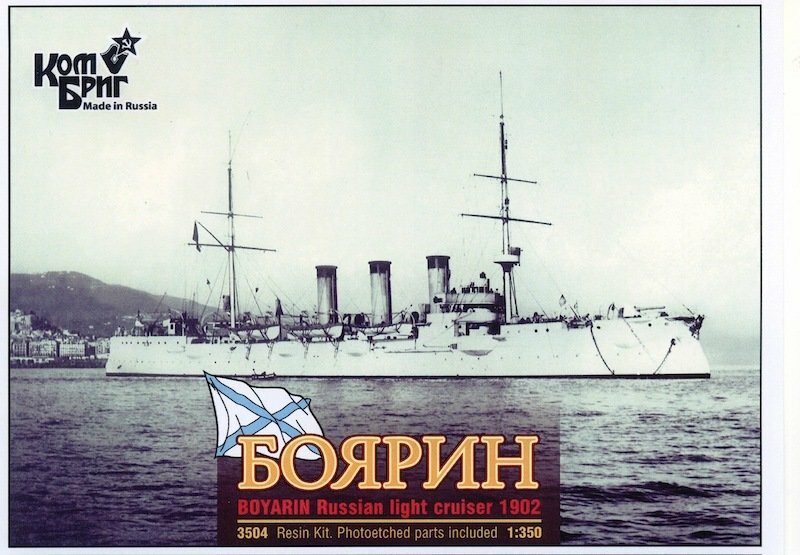 The Boyarin (Russian: Боярин - "Nobleman") was a light cruiser built for the Imperial Russian Navy. It was built by Burmeister & Wain in Copenhagen, Denmark. It served in the Russian Pacific Fleet and was sunk by a Russian mine near the entrance to Port Arthur, Manchuria. The ship was commissioned in 1902 and sailed to the Pacific arriving in Port Arthur in 1903. She struck a Russian moored mine near the entrance to Port Arthur harbour on 12 February 1902. An attempt to tow her to safety was made but she broke her tow , drifted onto another mine and sank.